The two friends turned rivals kept one of the hottest rivalries going at Fastlane. 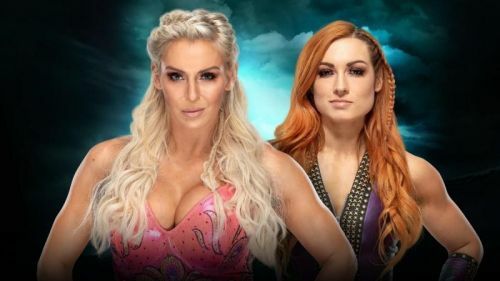 The feud that has been going on since SummerSlam last year continued at Fastlane with the stipulation that Becky Lynch would be re-added to the Raw Women's Championship match at WrestleMania. Lynch had already earned that spot with her win in the Royal Rumble, but she was suspended for 60 days after altercations with Stephanie McMahon and Triple H. She also refused to get checked out by a WWE doctor for clearance. Ronda Rousey has also turned on the WWE Universe, saying that she didn't need the paycheck from WWE or that she isn't like the rest of the WWE superstars. The crowd was hot for Lynch as she made her way to the ring on her one crutch. Flair continued to laugh at that fat as Lynch entered the ring. Lynch's arm was also taped. The two women faced off in the ring as Lynch still had her crutch in hand but threw it out of the ring. Flair mocked Lynch continually until Lynch punched Flair against the rope. They squared up and Flair pushed Lynch into the corner and immediately went for her knee. They exchanged strikes until Flair kicked Lynch's knee out from under her. Flair almost seemed as loud as the crowd as she continued to attack the knee by tying it up in the ropes. Lynch then made a move only for Flair to put Lynch into a half crab and then added elbows to the back of the head. Lynch eventually fought out of it but still couldn't get to her feet. She threw Flair to the outside but Flair snapped her leg against the ring curtain. Flair then chopped Lynch down at the knee before pointing to the WrestleMania sign. The taunting continued by Flair and she targeted the leg in the corner again. The patented Flair chops continued in another corner before Flair missed an attack on Lynch's knee again. Lynch got in a shot but fell down again. Lynch went for a small package but only gets a two count. She threw Lynch over her heard and out of the ring. Flair then threw Lynch into the ringside barricade before throwing Lynch back in the ring. The Queen then set Lynch up for a moonsault in the corner but is pushed off the top rope by Lynch. Flair hits the barricade. Charlotte Flair beat the 10-count but is immediately put into the Dis-Arm-Her. Flair broke it up and put Lynch in a Figure Four. Ronda Rousey then ran down to the ring and punched Lynch while in the Figure Four. Rousey and Flair stood in the ring defiantly as the announcer said that Lynch won the match and would be in the main event of WrestleMania. Flair looked pissed and while Lynch sat in the corner and laughed as her music played. Flair looked like the kid who had her ball taken away from her.